* An introduction to Electronics and Programming in the Appendices along with engineering formulas and PICMicro web references. * Placa de circuito impreso para un programador PIC incluido en el libro! Este programador tendrá la capacidad para programar todas las microPIC utilizada por la aplicación. * Veinte nuevos "experimentos" para ayudar al usuario a comprender mejor cómo funciona el PIC. * Introducción a la electrónica y la programación en los Apéndices, junto con las fórmulas de ingeniería y referencias PICmicro web. Microcontrollers. Microcontroller Chips. Programmable Logic Devices. Deciding Which Device to Use in Your Application. The Microchip PICmicro MCU. Device and Feature Summary. The MP LAB IDE. FUZZYtech. KEELOQ. The Parallax Basic Stamp. PICmicro MCU-Compatible Devices. The PICmicro MCU Processor Architecture. The CPU. The PICmicro MCU's ALU. Data Movement. The Program Counter and Stack. Reset. Interrupts. Architecture Differences. The PICmicro MCU Instruction Set. The Mid-Range Instruction Set. Other PICmicro MCU Instruction Sets. PICmicro MCU Hardware Features. Power Input and Decoupling. Reset. Watchdog Timer. System Clock/Oscillators. Configuration Registers. Sleep. Hardware and File Registers. Parallel Input/Output. Interrupts. Prescaler. The OPTION Register. Mid-Range Built-in EEPROM/Flash Access. TMR1 and TMR2. Serial I/O. Analog I/O. Parallel Slave Port (PSP). 17Cxx External Memory Connections. In-Circuit Serial Programming (ISCP). Future Devices. PICmicro MCU Application Design and Hardware Interfacing. Estimating Application Power Requirements. Reset. Interfacing to External Devices. LEDs. Switch Bounce. Matrix Keypads. LCDs. Analog I/O. Relays and Solenoids. DC and Stepper Motors. RIC Servo Control. Serial Interfaces. PC Interfacing. PC Interface Software. Serial Ports. Parallel Port. Keyboard and Mouse Ports. ISA Bus. PICmicro MCU Application Software Development Tools. Software-Development Tools. High-Level Languages. MPSIM.INI. Stimulus (.STI) Files. FUZZYtech. Version Support Tools. The MPLAB IDE. PICmicro MCU Assembly-Language Soft-Ware Development Techniques. Creating and Supporting Your Code. PICmicro MCU Programming Tips. Interrupts. Event-Driven Programming. State Machine Programming. Porting Code Between PICmicro MCU Device Architectures. Optimizing PICmicro MCU Applications. A Baker's Dozen Rules to Help Avoid Application Software Problems. Macro Development. The Difference Between Defines and Macros. The Assembler Calculator. Conditional Assembly. Debugging Macros. Structured Programming Macros. Designing Your Own PICmicro MCU Application. Requirements Definition. PICmicro MCU Resource Allocation. Effective User Interfacing. Project Management. Debugging Your Applications. Characterizing Problems. Hypothesizing and Testing Your Hypothesis. Simulating Applications. Programming PICmicro MCUs. Hex File Format. Code-Protect Features. Low-End Programming. Mid-Range and ICSP Serial Programming. PIC17Cxx Programming. PIC18Cxx Programming. PICSTART Plus and PRO MATE II. The El Cheapo. The YAP-II. Third-Party Programmers. Emulators. MPLABICE-2000. The PICMaster. MPLAB-ICD. The EMU-II. Other Emulators. Experiments. Tools and Parts. PICmicro MCU Processor Execution. Jumping Around. Data. Subroutines. Table Data. Playing with the Hardware. Analog Input/Output. I/O with Interrupts. Serial I/O. Debugging. Projects. Low-End Devices. Mid-Range Devices. PIC17Cxx Devices. PIC18Cxx Devices. Real Time Operating Systems. RTOSO1: Simple PIC18Cxx RTOS. RTOS02: Multitasking Application Example. In Closing. Useful Tables and Data. Physical Constants. Audio Notes. "Touch-Tone" Telephone Frequencies. Electrical Engineering Formulas. DC Electronics Formulas. AC Electronics Formulas. Mathematical Formulas. Mathematical Conversions. ASCII. ASCII Control Characters. IBM Extended ASCII Characters. Resources. Microchip. Contacting the Author. Buying Project Kits Presented in this Book. 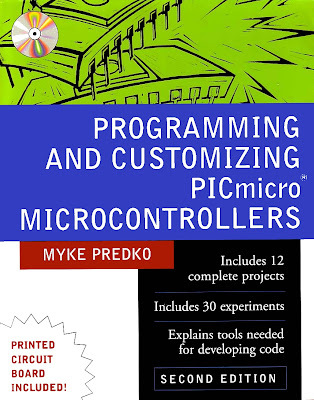 PICmicro MCU Books. Useful Books. My Favorite PICmicro MCU Web Sites. Periodicals. Web Sites of Interest. . PICmicro MCU Product and Service Suppliers. GPASM/GPSIM LINUX PICmicro MCU Application Tools. CD-ROM. Accessing the CD-ROM Files. Rentron Articles.